Length - 15 1/2" x Width 7 1/4". Two leather tie on straps which go around your neck - Length 10". 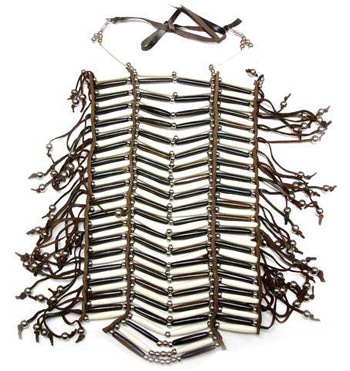 These breastplates are made from genuine bone hairpipe with leather spacers. Decorated with silver plated brass beads. There is fringe down both sides. Makes a "jingling" sound when you walk. Available as pictured or in all white.